It is almost certain that football was being played in some shape or form prior to the formation, in 1892, of the Falkland Island Volunteers, the pre-runner of the present day Falkland Islands Defence Force. Members of the Volunteers enjoyed their soccer and the inter-Platoon rivalry was fierce and very combative. There is strong evidence that a ‘Stanley Football Club’ under the Chairmanship of Mr. J.McNicholl, existed in 1916. Investigations have revealed that the Rev. D. McDonald-Hobley, who was a very enthusiastic sportsman, formed this Club. The Club was very successful and it was decided to change its name to Athletic Club and introduce cricket. 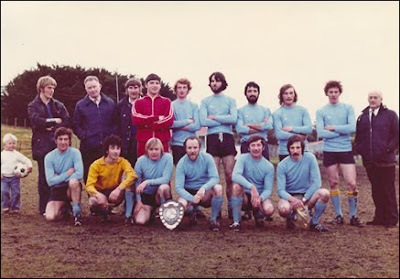 Such a strong hold did the Volunteers have on local football that in order to get regular games a man was required to ‘join-up’ on reaching the age of 18, otherwise it was virtually impossible to obtain a competitive match. However, according to the former player and Club Chairman the late Joe King, a ‘Jubilee Club’ was formed in the 1930’s by youths leaving school who were too young to join the Volunteers, and by those who had no desire to join the local Force. Their numbers were so few that they were unable to form a League but they did often play against the F.I. Volunteers in challenge matches. The outbreak of the 2nd World War brought the Second Battalion of the West Yorkshire Regiment to defend the Falklands and they provided stern opposition to the local team on the soccer field. A League with 7 teams was formed but the local side was somewhat outclassed by the near professional standard of the Garrison teams and finished 6th. 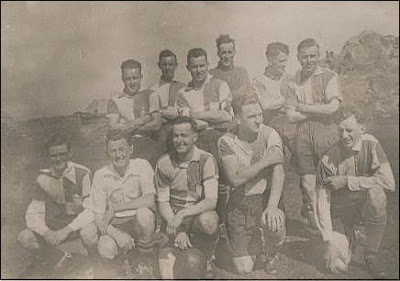 Many of the players who were later to serve the Stanley side for many years earned their baptism against the soldiers who also had their own inter-service competitions. One of the West Yorks who played regularly against the local lads was a young Warrant Officer named Don Clarke, who after the War returned to the Islands and in addition to becoming Chairman of the present Club, also captained the local side from his favoured inside left position. After the West Yorkshire Regiment was withdrawn and replaced by The Service Corps and Royal Scots detachments a new league was formed with 6 teams – Scots 1 and 11, Corps 1 and 11, the Navy and the Falkland Islands Defence Force. The F.I.D.F. finished as ‘runner-up’ in this League. On the 3rd January 1947 under the Chairmanship of Captain L Aldridge, 30 persons interested in forming a new Football Club met in the FIDF Drill Hall and Met Forecaster and Radio Announcer Don McNaughton was elected Secretary. Elected to the Committee were Joe King, Bill Jones and Don Clarke, all 3 of whom would play a major role in Falklands football in the succeeding years, and George Perry, father of the late Tom Perry, another 1st team regular. So the Falkland Islands Football League was formed. 4 teams were established under the names of Hotspurs (Green & White Quarters), Stanley Dynamos (Yellow & Black stripes), Stanley Redsox (Blue & Red stripes) and Stanley United (White). Redsox won the first League Championship. The Stanley team enjoyed considerable success led by Don Clarke and ran up big scores against the Royal Naval frigates such as the St. Austell, Bigbury and Burghead Bay, although they found the Veryan Bay a much tougher prospect. A 5-1 victory against HMS Superb saw Tom Perry score a hat-trick. On the 8th January 1957 a large crowd gathered to watch the local team take on Her Majesty’s Royal yacht ‘Britannia’. His Royal Highness the Duke of Edinburgh was on board. It was, at the time; probably the most important game ever played in the Islands. Sadly for the Falklands team the game ended in a disappointing defeat by 5 goals to 2. Tom Perry with a penalty and Tony Carey scored the Falklands goals. Stanley team: Doug Hansen, Nut Goodwin, Ted Garner, Bill Jones, Doug Morrison, Joe King, Tom Perry, Tony Carey, Roddy Bonner, Don Clark (capt.) Steve Reive. During the 50’s, 60’s and even into the 70’s it was considered a great honour to play for Stanley and so represent the Falklands. The arrival on an annual basis of HMS Protector, a South Atlantic ice patrol ship, saw a new 5 match series for the famous ‘Shield’ introduced. The games were always evenly contested and some memorable series took place with usually one team dominating for several years and then the tide turning. A new breed of players like Les Biggs, Owen May and Terry Betts became the backbone of the team. Possibly the largest crowd ever to watch a football game in the Falklands turned out to see the local side play a team of Argentine workers in the final of a 4-team tournament in the 1970’s. The Argentines were a group of young men who were building fuel tanks in the Falklands as part of an Agreement between the British and Argentine Governments for the Argentine fuel company YPF to supply fuel in the Islands (against the wishes of the population) The resident Royal Marine Detachment and a team representing Johnstones Construction Company, who was building Stanley Airport, were the other two teams in the League. Amid great excitement Stanley beat the Argentines by 2-1. HMS Endurance replaced Protector but the Shield series continued. It was on the eve of the 1982 Invasion by Argentine Forces, just as Endurance claimed the Shield and the final whistle went, that the vessel was ordered to proceed to South Georgia, and its Royal Marines instructed to evict the Argentine scrap metal workers. The rest is history of course. It took several years after the War before football returned to its original format and the league system was re-introduced. With thousands of British Troops on the Islands, first team games were played practically every Sunday afternoon and James Peck established himself as probably one of the best players ever to pull on the National shirt as he scored a hat-full of goals every weekend. The new ‘Knockout Shield’ eluded Stanley despite two final appearances, while it was not until the 1999/2000 season that its successor the Veterans/Tri Services Cup was finally achieved. 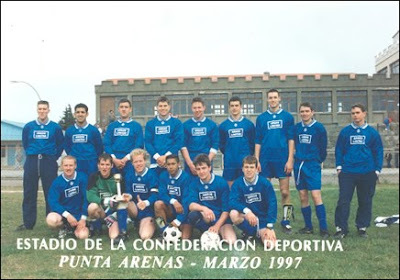 To celebrate the 50th anniversary of the formation of the Falkland Islands Football League, a 3 match tour of Southern Chile was arranged in March 1997, and the Falklands team under the Management of former player Patrick Watts brought back the ‘International Trophy’ after beating the University of Magallanes after a thrilling penalty shoot-out. One game was drawn and the other lost in what was probably the first ever International tour by a Falklands football team. Team: S Goodwin, A Steen, M Cofre, A Aminian, J Curtis (capt. ), W Clement, B Chater, D McCormick, D. Clark, P Riddell, J. Henry. Subs: M Clarke, G Ross. 23/03/97 - International Cup. Universidad Magallanes 1 Falkland Islands 1 (Martyn Clarke) Falkland Islands won 4-3 on penalties. Team: S Goodwin, R Smith, M Cofre, A Aminian, J Curtis, W Clement, B Chater, D McCormick, M Clarke P Riddell, J Henry. Subs: L Clarke, D Clark, G Ross. Falklands Team holding the 1st Encuentro Internacional Trophy of Football after beating University Magallanes in Punta Arenas Chile on the 23rd of March 1997. The system of allocating all registered League players to teams was dropped in favour of sponsored teams with the sponsoring Business or Company purchasing a full kit for players. 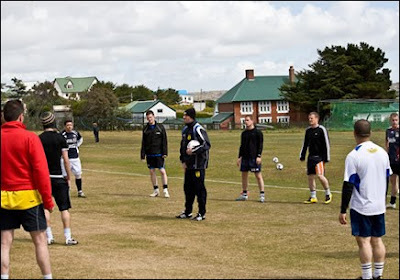 The Falklands soccer team faced its sternest test ever when travelling to the NatWest Island Games which were held on the Isle of Man in July 2001. A weekly local Football Pool raised more than £9,000 to assist with fares for the 20 players who were under the Management of Lee Mitchell, a Scotsman who built houses in the Islands. A series of fund raising dances/discos helped raise cash too. The team included 3 St.Helenians who obtained the necessary residency requirements while several lads who are studying in England joined the squad. The first game, not unexpectedly, resulted in a heavy defeat, by 9-0 against the host Island. The players took some time to adapt to a much bigger pitch than they had previously been accustomed to playing on. In their second fixture, against Guernsey, the Falklands played well and were unlucky not to score. Guernsey won 3-0. By their own admission the team played poorly against Greenland in the final fixture of the group series and were well beaten by 4-0, so finishing bottom of the group. 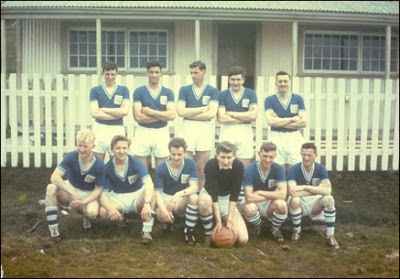 In the play-off matches to decide the final positions of the Islands, the Falklands came up against the Orkney Islands and produced their best performance of the Games. Two goals by Colin Buckland, and one each by Stephen Aldridge and Jeremy ‘Spurs’ Henry ensured an exciting and well merited 4-1 victory. 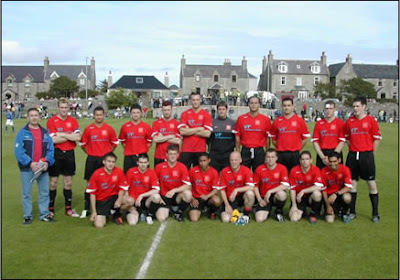 Four years later in 2005 the Falklands team again entered the Island Games which were held on the Shetland Islands. The opening game against the host island on a sunny Sunday afternoon drew a massive crowd. The Shetlands, who went on to win the gold medal, ran out winners by 4-0. In their second game the Falklands produced the biggest shock ever in Island Games football history, as they defeated the well fancied Estonian team from the island of Saaremaa by 2 goals to 1. Martyn Clark with a penalty opened the scoring, but the Estonians equalised just after half-time. Wayne Clement scored the Falklands winner mid-way through the second half. A much changed team recorded a disappointing 9-0 reverse against Guernsey in the next game. The match against Aland was eagerly awaited and the team considered that they had a chance of springing another surprise, but despite much pressure and many chances they went down by 2 goals to 1. Currently a 4-team league comprising Sulivan Blue Sox, Brintel Choppers, Sealed PR Athletic and Kelper Store Celtics is in progress under the auspices of the Falkland Islands Football League. Plans are being formulated to send the national team to compete in the Island Games of 2009 that will be held on the Finnish island of Aland between 27 June – 4 July. To assist preparation for the tournament a professional football coach from Holland visited the islands for 2 weeks. Rene van Risjwijk played professionally in Holland for 13 years and is now coach of the Under 14 team at Cambuur Leeuwarden. In addition to giving valuable advice to the first team squad he also offered coaching sessions to Infant, Junior and Youth players.